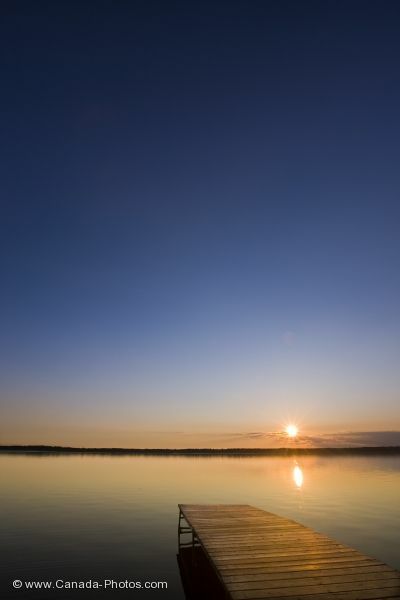 With barely a glimmer of sunlight left over Lake Audy in Riding Mountain National Park in Manitoba, Canada, the sunset hues still show their beauty across the surface of the water. A deep blue coloring highlights the sky as the horizon is adorned in a yellowish tinge as the sun closes off the daylight hours of another day. Vacationers to Lake Audy, can enjoy the beauty of a sunset while relaxing on the wharf, while others spend their days fishing from the end of the wharf. Campers can sit along the shores of Lake Audy, within steps of their campsite, to watch the sky light up at sunset as the calmness of the lake seems to mold into the landscape. Picture of a wharf at Lake Audy in Riding Mountain National Park in Manitoba and the sunset hues.